Leh is the capital of the Ladakh region of Jammu and Kashmir. The town is situated at a height of 3,505 metres on a mountain side in a valley to the side of the Indus River. It originated as a trading post and market attracting merchants from far and wide then developed into the administrative, commercial and cultural centre of the district. 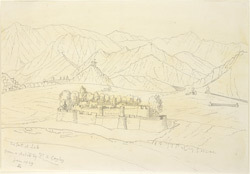 The earliest royal residence at Leh was the fort/palace built by King Tashi Namgyal in the 16th century. However the palace built in the 17th now dominates the town; it has nine storeys and was the home of the royal family of Ladakh until they were exiled to Stok in the 1830s.